If you have found yourself wishing for the big negative and sharp Zeiss lens of your Hasselblad 200 or 500 series when you travel, but you don't know how to carry the precious cargo without harm, then you have found a solution with the Hasselblad Wrap. 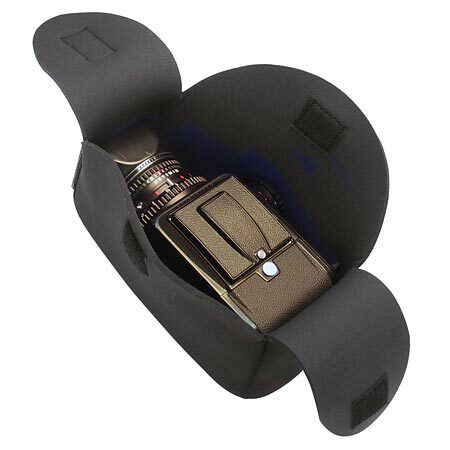 The Hasselblad wrap is a neoprene and Velcro form fitting case for a Hasselblad "V series" camera, with film or digital back, lens and a variety of finders. The wet suit material used in this unique case not only stretches to meet the challenges of differently configured camera/lens/back combinations, but it also provides a high shock-absorption for bulk ratio. In addition, the case is water resistant and will slip right into any back pack or carry bag you use to travel to exotic locations. While you are working, the bag also makes an excellent sack for spent film until you have time to repack at home base. It also has a pocket to host your dark slide while you shoot, or even to carry a spare darkslide. That feature provides for that one emergency which leaves you thanking your bag for letting you keep shooting, when you would have been stopped cold without it! all information herein ©2004-2009, The Photo Village, Inc.